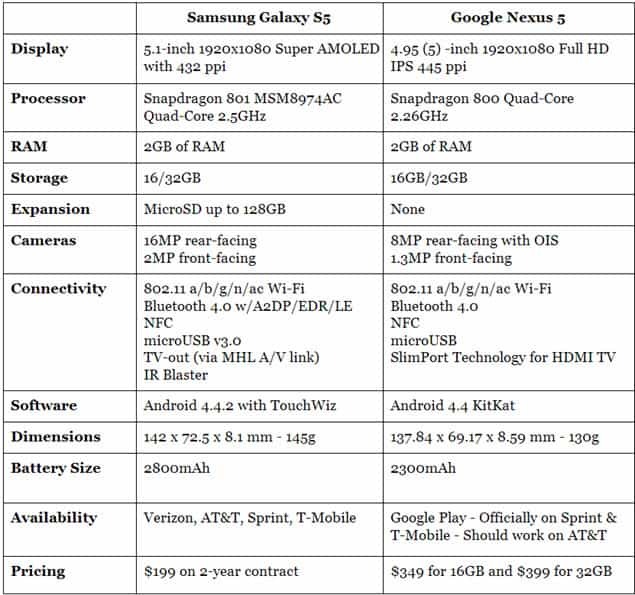 Here is the comparison between the heavily skinned Samsung Galaxy S5 with TouchWiz versus the ‘virgin’ of our Android family, the Nexus 5 (made by LG) with Android 4.4.2 KitKat as Google meant it to be. Some users love the pure Android experience and others feel that TouchWiz, Sense , and Optimus UI add more user options, making their Android experience even better – this debate will never be resolved, so I will not even attempt to do that in this short comparison. The Nexus 5 and Galaxy S5 are really more alike than they are different – the displays are close in size, but then the differences show up. The processors are even close, with the Galaxy S5 using the newer Snapdragon 801 model, which is basically an overclocked version of the Snapdragon 800 found in the Nexus 5. They have the same 2GB of RAM and the same 16GB or 32GB models and are both running Android 4.4.2 KitKat. They are also very similar in size and weight. Take a look at the specifications below and then we will discuss some of the differences before a winner is chosen. The new Samsung Galaxy S5 is an evolution to the most popular Android device of all-time, the Galaxy S4, and improved in all areas – from hardware to software. Gone is the Samsung bloatware – moved to a folder where the user can access it and download it if they want to use it – an a lighter, kinder TouchWiz (although it still needs more reworking). The processor is not too different from the one in the Nexus 5, although gamers and video users will notice a smoother and faster interface. The Galaxy S5 does include a microSD slot to add up to an additional 128GB of storage – nice for storing videos, movies, photos and music, if you are not a ‘cloud’ person. The displays are about the same size, however the Galaxy S5 uses the Samsung AMOLED technology and the Nexus 5 uses the IPS technology – the newest Samsung display is much brighter and can give you either the saturated colors or the truer, more natural colorings – your choice. The cameras on the Samsung models have always been good and the new 16MP shooter with ISOCELL technology should be no different, certainly trumping the Nexus 5′s 8MP camera. The sizes are very similar, although the Galaxy S5 is a little heavier, probably due somewhat to the larger, 2300mAh vs 2800mAh battery in the Galaxy S5. It also sports USB 3.0, an IR Blaster, fingerprint sensor and a Heart Rate Monitor. 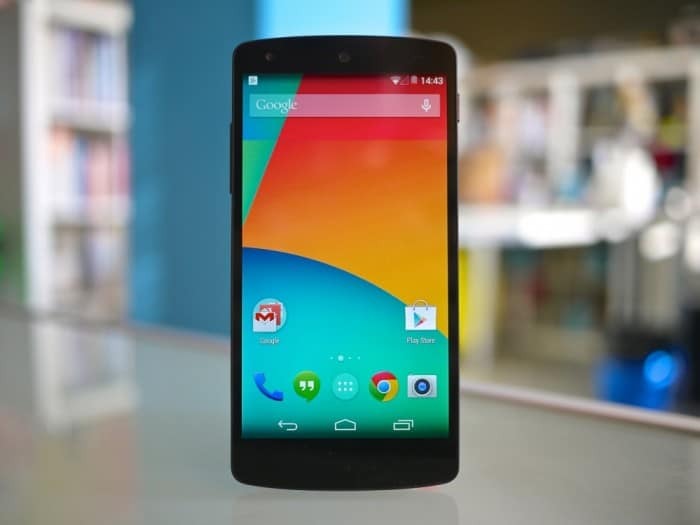 The Nexus 5 is, without a doubt, the most advanced Nexus smartphone that Google has ever presented us with. And yes, I know that it runs smoother than the Galaxy S5 with TouchWiz, but a smartphone is a lot more than smooth action. The pure Android KitKat is its one claim to fame – even with its 5-inch screen, Snapdragon 800 processor, and 2GB of storage, there is just not a specification of the Nexus 5 that outshines the Galaxy S5. Being a Nexus device, it will always have its updates sooner than other devices, so if that is important to you, and with most Nexus owners it is, then the Nexus 5 would be your device of choice. The other area that the Nexus 5 excels in would be VALUE – at $349 for the 16GB model and $399 for the 32GB model, and these are off-contract pricing – you cannot beat what you are getting for your hard-earned dollars. Our reviewer, Tom, loved the device and bought one for himself. My apologizes to our loyal Nexus 5 lovers, but the new Samsung Galaxy S5 is just a bit too much, spec-wise, for the Nexus 5 to handle. While you might not like the ‘dimpled’ design that Samsung used on the back of the Galaxy S5, when compared to the Nexus, it still looks as good even though Nexus goes for the ‘minimal’ look. They both will feel great in your hands as your everyday driver. The newest screen technology, slightly faster processor, the option to add additional storage, the better camera, the larger battery and the addition of a fingerprint scanner, Heart Rate Monitor, the water/dust resistance and software enhances with the new Ultra Power Saving Mode, the ability to track your stolen device, and even the bloatware removal, all add up to the new Galaxy S5 as the champ in this comparison. If you detest two-year contracts, where you can get the new Galaxy S5 for $199.99 (and even BOGO at Verizon), then the Nexus 5 may be the device for you…it is a very good value. Please hit us up on our Google+ Page and let us know which device you would pick in this comparison – a comparison based solely on specifications and features. 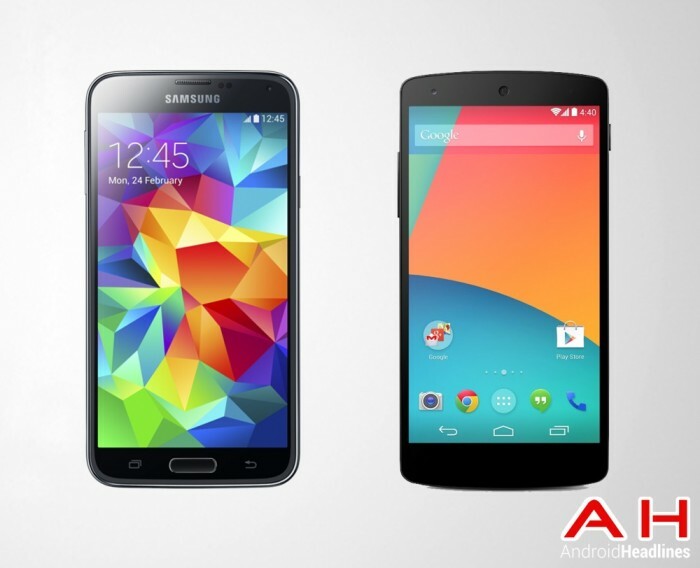 The post Android Phone Comparisons: Samsung Galaxy S5 vs Nexus 5 appeared first on AndroidHeadlines.com |.